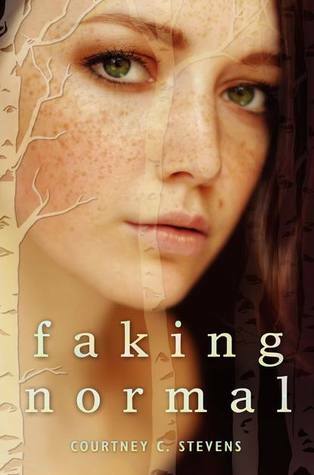 Faking Normal is a YA contemporary about a high school junior named Alexi. She is struggling emotionally after an assault that took place a couple of months prior to the start of the book. She has been hiding her pain from her family and friends, but she can’t fool Bodee. Bodee and Alexi have known each other since childhood, but they were nothing more than acquaintances until the death of Bodee’s mother. They are both concealing their secrets as best they can, but they can see through each other's pain. As their friendship builds, they begin to confide in one another. They help each other cope in healthier ways than they resorted to on their own. Together, they regain their strength and confidence. I don’t want to give away too much of the story, so I will simply say this was an exceptional book. I have to thank Amy Plum, author of the Revenants series, for sharing it with me. Amy tweeted about it a while back, but that is probably the only time I have heard of this book. I added it to my to-be-read list and I am thankful that I did. The story was very well written and presented a difficult subject matter in a way that readers can learn and benefit from. The only thing I can compare it to is Bitter End by Jennifer Brown, which I also loved. I never would have picked up either of these books based solely on the descriptions due to the heavy topics, but they left a lasting impression that I will not soon forget. I would highly recommend Faking Normal to every YA reader. This is the type of book I would have loved to have read as part of an English class growing up. The story is gripping and the characters are engaging. Students would enjoy reading this book while learning in the process.